Blueberries are so delicious and they make the perfect snack just about anytime, anywhere. Now days they are available year-round at quite reasonable prices. 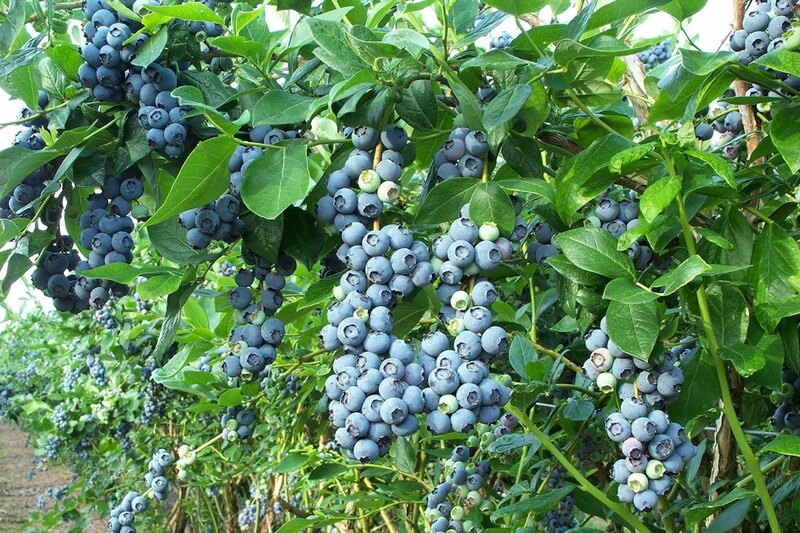 I couldn't begin to calculate how many pounds of Blueberries I have sold over the last 25 years... or Eaten! When buying blueberries you should turn over the plastic container and check the bottom for wetness and mold. If there is a white liner in the bottom of the container make sure it has not turned blue, a sign that the fruit is not fresh. Always open the container and gently squeeze the berries, they should be firm and hard (not wrinkled). Soft berries spoil quickly and are usually a sign of old age or heat stroke. Bigger fruit is ALWAYS sweeter. 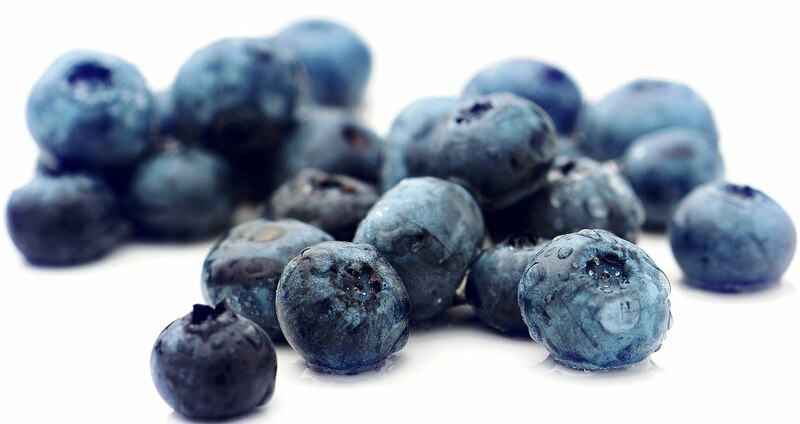 Blueberries have a natural white powdery look on their skin (as do plums and apples), this is a sign of freshness. Berries that look dull and lacklustre will be soft, mushy and almost tasteless. Blueberries should be blue in color, immature berries will have a greenish or yellow tinge. If you are buying a case of berries make sure you gently shake the box of berries so you can check the interior bottom of the box for wetness and mold. You would be surprised how often a box of blueberries looks beautiful on top and the bottom is bad. On extremely hot days, heat affects the quality of the fruit so reputatble growers will stop picking earlier in the day to maintain a certain quality standard. While not so reputable growers will continue picking fruit which becomes soft quickly due to the extreme temperatures. This can often reflected in the price at the store, a "No Name" brand versus a "Driscoll or Dole" label. Generally speaking when you see a great buy for Blueberries, Strawberries, Cherries, Corn or Grapes in your local newspaper they are being sold as a loss leader to entice shoppers into their supermarkets. Remember if you want good produce in your local grocery stores you need to write out customer complaint cards and include the grower's name whenever possible. 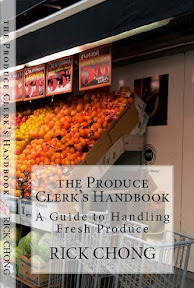 With centralized purchasing the Produce Buyers often never see the produce being shipped to their stores. Customer complaints are taken seriously and will be checked out. My specialty has always been growing, packing and selling Big Cherries. Unfortunately Mother Nature doesn't always cooperate and sometimes we must deal with the impact of unseasonably wet weather, extreme temperatures and insect infestations. Ouch! This coming 2011 season, frost damage will be widely seen in the fruit at the supermarkets. Produce Buyers will have to lower their normally high standards to ensure they have continuous supply and to appease growers. Hopefully this year's *June Drop will not adversely affect the crops. 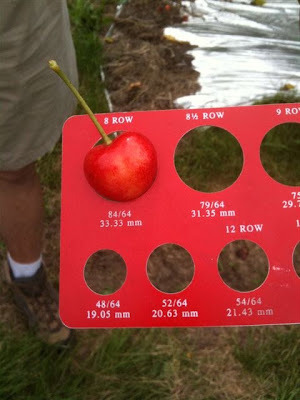 There are many types of splits and cracks referred to when it comes to cherries but I will simplify it here. First is the "Horseshoe Split" which is on top of the cherry, a brown ring or crack around the stem caused by a drop of rain sitting atop the cherry after a rainfall. "Bum Split" on the bottom of the cherry, again this is caused by rain. The "GA Split" (Gibberelic-acid) which is a chemical sprayed on most cherries today in the Northern Hemisphere to delay the maturity of the cherry (late cherries usually sell for more) and making it crunchier. 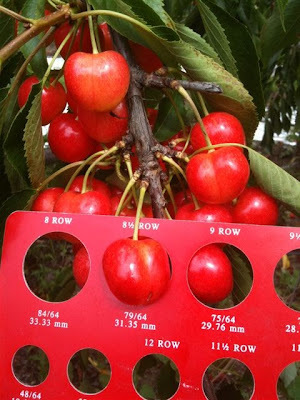 While in the Southern Hemisphere growers often use Ethrel to speed up the maturity of cherries (Early cherries sell for more). * Every June, cherries while still in their infancy will naturally fall off the trees. This is Mother Nature's way of thinning cherry trees of their overabundant fruit. Now here are some photos of some beautiful Yellow "Early Robin" cherries being picked a couple of days ago in Washington State. 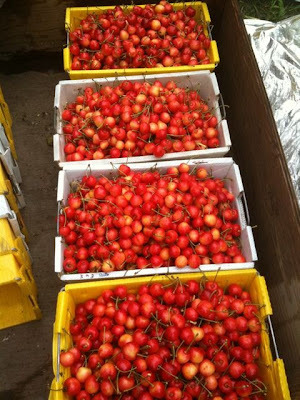 This particular variety is very similar to a Yellow Rainier cherry and will be marketed as such. 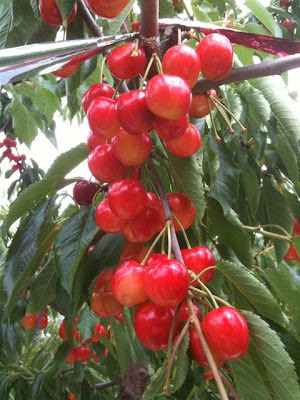 This cherry tends to be very big fruit, supersweet and they have a wonderful red blush. Don't you think? These cherries are huge they average about 1.25" inches in diameter. Probably cost about $5.99/lb for these in supermarkets if you can even find them. Most fruit of this quality is destined for overseas markets where they can command even higher prices.